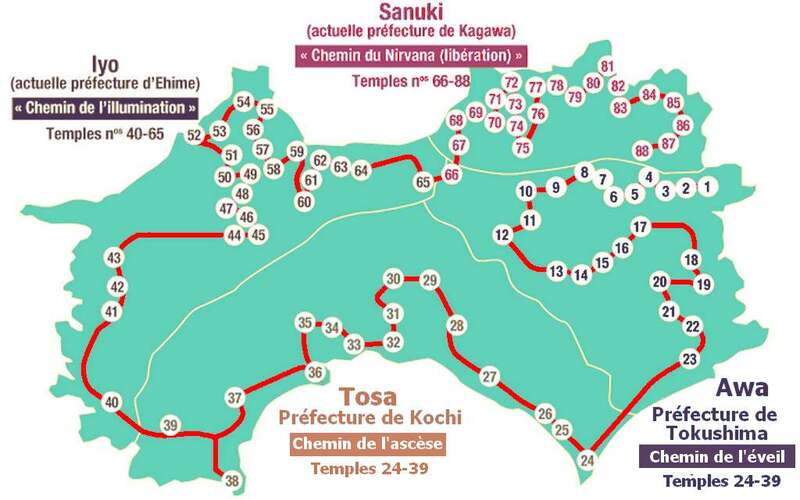 Here is a map showing an overview of the 88 main temples (excluding Bangai) of the Shikoku pilgrimage. This pilgrimage takes you in the footsteps of Kobo Daishi, the founder of Shingon School, during his training over 1200 years ago.The pilgrimage route (henro michi) runs through the four prefectures of Shikoku Island. You can access the record of each temple by clicking on its number. For more information on the Henro michi pilgrimage : Hachiju hachi kasho Kesako ?